Egypt is blessed with one of the longest coastal surfaces in Africa, with coasts on two continents and one of the most important water passageways in the world. Consequently, major international manufacturers from the marine industry have long been established in Egypt to provide core services to military, oil and gas, and general trade sectors. 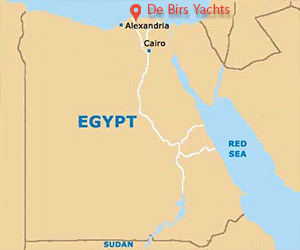 De Birs Yachts is one of the landmark factories in Amreya free zone in Alexandria. Close to shipping ports and two airports, its supply chain management and customer service is speedy and efficient. The locations we have identified are close to many experienced engineers and craftsmen from the Suez Coast to Hurghada. The factory spans for 10,000 square metres, 6,000 of which are indoors, and with a potential of further expansion. The scalability plans we have, will also enable De Birs Yachts to provide MRO services to the Egyptian and Saudi marine fleet. De Birs yachts is dedicated to the production of the entire fleet of its own brand and is equipped with specialized internal facilities to manufacture motorboats and yachts of many sizes. The Shipyard boasts several in-house workshops for the finest carpentry, mechanical, electrical, upholstery, lamination and polishing and 22.3 meters pool testing facility. We work with top of the line multinational suppliers and apply best practices and workmanship leaving no room for product compromise. We have the resources that allow us to be bold and ambitious in design and deliver great value on time!